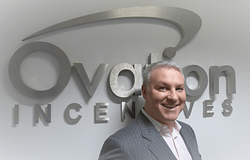 Ovation Incentives, based in London UK, has today signed a strategic marketing alliance with GC Incentives|GiftCertificates.com, the leading US incentives and rewards company based in Omaha Nebraska. The agreement will enable customers of both companies to benefit from the combined technology, reward and motivation solutions offered by these industry-leading innovators. The move is designed to take advantage of major trend facing the incentives and recognition industry. With increasing numbers of US companies demanding global reward and recognition solutions and European companies seeking comprehensive US reward coverage, the alliance brings together these recognised market specialist firms to deliver a single-source solution. The sharing of knowledge, technology and relationships between the firms brings a combined 36 years of customer experience to the marketplace, having successfully served customers in over 100 countries. This strength of heritage will be evident as the companies begin to market their combined solutions in the coming months. Jonathan Grey said the alliance with GC Incentives will extend the reach of Ovation Incentives, which he founded in 2001. "This alliance is a very natural fit for Ovation. In GC Incentives we see a company that shares the same values of innovation and customer success that we endeavour to follow ourselves. The business methodology behind our technology and product offerings are very similar, and I’m sure that our customers will see this alliance, and the strong connections that it brings, as a win-win for all." For GC Incentives, the opportunity represented by the alliance with Ovation Incentives is one that CEO Rick Buer said will provide strategic benefits to customers. "We already know how important having a global footprint is to those who look to the incentives industry for leadership," said Buer. "Working with Ovation Incentives is one more step forward in delivering that global perspective in our business." The alliance enables GC Incentives to market Ovation’s Encore platform for global employee recognition solutions, as well as their Universal Voucher System for global reward solutions. GC Incentives will make its GiftPass reward fulfilment technology available for use in the U.S.
As part of the alliance, Ovation Incentives' Universal Voucher technology will be further developed to meet various client needs for both companies, an example of which would be initiatives to promote corporate wellness programs and sales incentive solutions. With two decades behind them, GC Incentives challenges common practices in the incentive and recognition industry with innovative solutions that provide mobile-optimised tools to manage and deliver incentive and recognition programs. Businesses can avoid complex, expensive platforms and leverage their own systems to deliver high-value gift card rewards. GC has easy, effective and efficient solutions that keep more than 95 percent of budget invested in what matters most—people. The company remains agile and responsive to industry needs for large and small business alike. GC Incentives has state-of-the-art program solutions for clients in automotive, wellness, human resources and sales and marketing arenas. Learn more at http://www.gcincentives.com. Ovation Incentives is a technology-focused performance improvement agency. Since 2001, it has helped its clients improve performance by providing incentives, rewarding and motivating customers, partners and employees. Ovation does this by combining its world-class global reward portfolio with tailor-made technology systems to deliver award-winning solutions. Ovation offers engagement incentives and reward programs across 120+ countries, 35 languages and 35 currencies. Learn more at http://www.ovationincentives.com.